We know many modelers will have been buying our kits from the earliest days – but may not have gotten around to building them. Or you may have bought one recently at a local swap meet or hobby shop sale. Can you still build these old kits? Of course the answer is ‘yes’ – but please be aware of some points. If the kit is missing parts - possible with a kit bought second-hand - it highly unlikely Glencoe Models itself can replace them, especially with very old kits. Ask around, maybe someone has a kit with spare parts, or you could adapt parts from another kit, or even scratch-build new ones? You could also look at on-line auction sites, someone may be selling a kit, 'as a builder' or ‘with parts missing’ – though of course check the part you need is there! The parts themselves however will not have aged. Injection molded polystyrene, from which these kits are made, is a high stable plastic and as long as the parts have not been subjected to a very high temperature - so they have melted! - they will still assemble as intended. Missing plans – again ask around. These are the easiest to reproduce, as they can just be copied. Glencoe Models is looking into the possibility of putting copies of plans on-line – but - please note - this is not available at this time. Decal sheets can the most difficult to deal with, as generally decals do not age well. 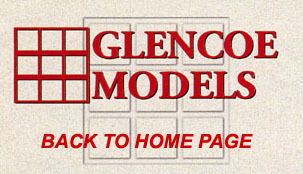 For this very reason, Glencoe Models does not keep spares. Old decals can crack and fall apart when placed in water. If you have any doubt as to whether the decals are usable, examine them under a good light – see if there are cracks in the decal surface. If so, over-spray them with a clear varnish, and allow to thoroughly dry. You may wish to do this even if no defects can be seen, ‘just in case’. The decals will then have to be cut out individually, but this is better than no decals at all. There is no guarantee they will then ‘work’ as intended, but this is usually a safe method. Decals can also be scanned and new ones made, but this requires certain skills and access to special computer programs, so may not be suitable for all.